Engineers successfully updated the Curiosity rover's computer software over the weekend and plan initial tests of the mobile science lab's ability to drive across the martian terrain within the next week or so, project officials said Tuesday. "We couldn't be happier with the success of the mission so far," said Ashwin Vasavada, Mars Science Laboratory deputy project scientist. "Most significantly at this point, since we're still in our commissioning phase, we have a fully healthy rover and payload." Mission manager Mike Watkins said that with the successful installation of surface-optimized software, version R10, the initial phase of the rover's activation and checkout -- phase 1A -- is complete. Engineers are beginning phase 1B "and that includes a mobility checkout," he said. "So (we will have) commissioned everything but the (robot) arm and the drill sampling system after about a week from now," he said. "That means there's a lot of science we can do. ... We can drive around, go to a better target, sort of use our remote sensing equipment. And then we want to go into a phase where we check out all the arm joints, take the arm out, stretch it, do its wake-up exercises. "So I think the final completion of characterizing the sampling system is still a fair ways away, probably a month away or something. But after the end of this week or so, we have a lot of capability we're able to turn over to the science team." 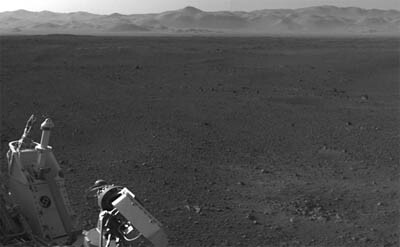 Curiosity made a pinpoint landing on the floor of Gale Crater last Monday. Scientists expect to spend about a year studying the rocks and soil of the crater floor while Curiosity slowly makes its way to the base of Mount Sharp, a three-mile-tall mound of layered rocks about five miles away as the crow flies that represents a major mission objective. If all goes well, Curiosity will climb the lower slopes of Mount Sharp in the second half of its planned two-year mission, crossing over beds that mark the transition from a warmer, wetter past to more recent drier environments. "It's fair to say the science team and our rover drivers and really everybody are kind of itching to move at this point," Vasavada said. "The science and operations teams are working together to evaluate a few different routes that will take us eventually to Mount Sharp, maybe with a few waypoints in between to look at some of this diversity that we see in these images. "It's going to take the good part of a year to finally make it to these sediments on Mount Sharp. So really, we're trying to just keep our eyes on the prize, finish these checkouts and then get going." A high-resolution photo snapped by NASA's Mars Reconnaissance Orbiter was released Tuesday, clearly showing Curiosity on the surface with radial blast patterns nearby where the rover's sky crane descent engines blew away topsoil. Another oblique view of Gale Crater, with Curiosity's actual landing site pinpointed, illustrated the upcoming drive to the base of Mount Sharp, including a field of sand dunes that must be traversed. Using high-resolution orbital photography, the science team has identified at least six possible routes to the base of the mountain. But Curiosity will not get there in a hurry. "Our goal and our scientific mission lies on the lower slopes of Mount Sharp," Vasavada said. "But part of understanding Mount Sharp is understanding the context around it and some of the features that have formed on the plains that we're at. So we'll spend a little time characterizing the most important units along the way." But "characterizing" a rock formation will be a time-consuming process and even though the science teams plans to minimize the number of stops Curiosity makes on the way to Mount Sharp, it is expected to take about a year to get there. "It's probably a few weeks of activity (for each targeted formation along the way) because it might mean acquiring a sample, for example, which takes a few weeks to find that place to get the sample, to deploy the arm, to acquire the sample and process it in our lab," Vasavada said. "So maybe two or three samples, perhaps, on the way, that's already a month or two. "We're still evaluating the capability of the rover on the terrain that we now see from eye level. ... We estimate we can drive something like a football field a day once we get going and test out all our driving capabilities. And if we're talking about a hundred football fields away, in terms of 10 kilometers or so, to those lower slopes of Mount Sharp, that already is a hundred days plus."